Whether you’re thinking about selling your home, renting your property or just want an upgrade, renovating can give your property a whole new lease on life and is one of the best ways to increase a home’s value. But renovating can be costly, and it’s important not to spend more than what you can add to the home’s value. The general rule of thumb is to spend no more than 5% to 10% of the total value of the property on a renovation. And, the good news is that with a bit of penny-pinching, you can get great results for even less than that. Here’s a room-by-room guide to budget home improvement tips and ideas. ● Buy a complete kitchen – If you want to do a full overhaul, consider buying a complete kitchen, as the total cost will usually be a lot lower than buying parts separately. ● Stick to neutral tones and classic features – As tempting as it may be to match your kitchen to the latest design trends, keeping the design simple means you won’t need to update your kitchen for a long time, and it’ll appeal to a wider range of people when you sell your home. ● Buy second-hand – Some suppliers sell fixtures, fittings and even entire kitchens second-hand, which are usually in great condition but cost a fraction of the price of buying new. 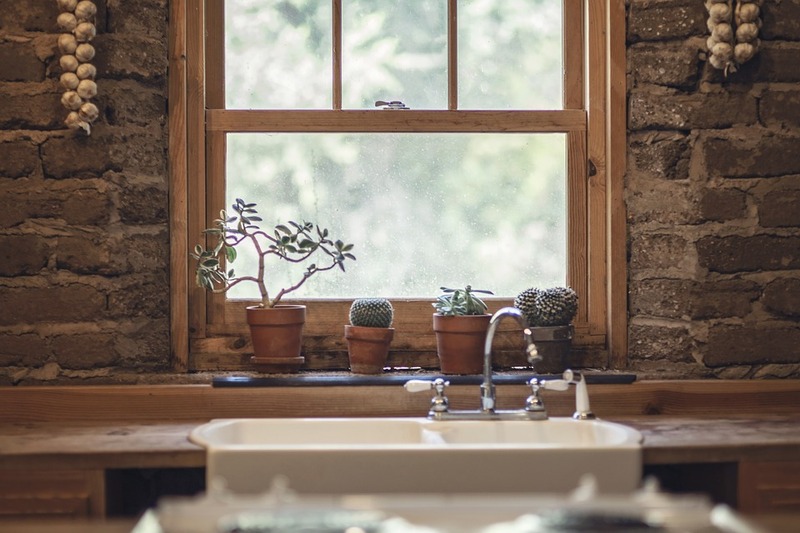 ● Update the tapware – It’s an easy and cost-effective fix, but one that can have a huge impact on the look of your bathroom. Give your fixtures a facelift and you’ll be surprised by how much of a difference it makes. ● Re-grout the tiles – Grouting is one of the first signs of an ageing bathroom, especially when no amount of Ajax can get it looking white and bright again. It’s cheap and relatively easy to re-grout tiles, and it can make your bathroom look good as new. ● Don’t mess with the plumbing – If you can manage it, stick to renovations that allow you to keep your plumbing setup intact as major changes to pipes and drainage can add to the cost of your bathroom renovation significantly. ● Get painting – A new lick of paint can do wonders to any room of the house, and this is especially the case for the living room and bedrooms where most people tend to care about aesthetics and decorative appeal. ● Update the blinds – Blinds start to look dirty quickly and replacing them can make a big difference, especially if you’re also repainting the walls. ● Install built-in wardrobes – If you don’t have built-in wardrobes in the bedrooms, consider making the investment to have them installed as this feature alone can add value to your home. ● Create a path to the front door – Having a defined path out the front looks neat and inviting, and it doesn’t have to be very costly. Use river stones or pebbles spread over a weed barrier cloth as a cheaper alternative to paving or concrete. ● Add an alfresco dining area – If you have outdoor space that’s rarely utilised, tidy up the area so that it’s presentable and buy an outdoor dining set. It’s an instant upgrade without making any major structural changes to the garden. ● Build a DIY deck – Modular decking kits make it easy to build a deck at home inexpensively without having to be a master builder.